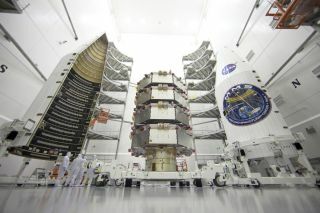 The four MMS satellites were stacked and packed inside an Atlas V rocket fairing in a clean room at the Astrotech Space Operations facility in Titusville, Florida. MMS is set to launch into space at 10:44 ET on Thursday night (March 12). Image released Feb. 19, 2015. CAPE CANAVERAL, Fla. — NASA is counting down to launch four small satellites into orbit on Thursday (March 12) on a mission to study an explosive cosmic phenomenon happening right on Earth's doorstep. The Magnetospheric Multiscale mission, or MMS for short, is scheduled to blast off on an unmanned Atlas V rocket at 10:44 p.m. EDT (0244 GMT on March 13), from Space Launch Complex 41 at from Cape Canaveral Air Force Station here. In the sun, these bursts of energy can cause solar storms that send showers of particles into space, potentially damaging man-made satellites. When it occurs near the Earth, magnetic reconnection can send particles toward Earth's atmosphere, which can be a hazard for astronauts but also excites particles in the atmosphere and creates auroras near Earth's north and south poles. The $1.1 billion MMS mission satellites were built and tested at NASA's Goddard Space Flight Center in Greenbelt, Maryland. Multiple institutions and universities contributed to the science and instrumentation on the MMS satellites. While other space missions have collected data on magnetic reconnection, but MMS is the first space mission dedicated solely to studying this phenomenon, according to a statement from NASA. It will collect data 100 times faster than any previous mission that has observed magnetic reconnection in space. Current weather forecasts predict a 70-percent good weather for the Thursday night launch. If NASA is unable to launch the MMS satellites on Thursday night, the agency can try again late Friday, mission managers said. Clay Flinn, launch weather officer with the 45th weather squadron at Cape Canaveral Air Force Station, said that the launch likely will be visible from Orlando, about 50 miles west of the launch site, but that clouds might block the view of the rocket once it reaches 25,000 feet (7,600 meters) in altitude. This would mean the view would be obscured when the two rocket boosters separate from the rocket. The MMS mission consists of four satellites that will fly in a diamond formation in order to study magnetic reconnection in three dimensions. MMS scientists will do propulsive maneuvers every two weeks to keep the satellites in formation, Craig Tooley, an MMS project scientist, said at the briefing. To enter their planned orbit, the satellites can launch any day of the year but must launch during a 30-minute window at night, Tooley said. About 15 minutes after launch, the four satellites will begin separating from one another in 5-minute intervals and will take up orbits that put them in a pyramid formation. This requires that the satellites be released very precisely from the Atlas rocket. "For about 20 minutes, we'll lock up the propellant tank vents and do everything we can to keep that vehicle stable and rock solid," said Vernon Thorp, a program manager for NASA missions with United Launch Alliance, the manufacturer of the Atlas V rocket. This is NASA's 12th launch with an Atlas V rocket, Thorpe said. Editor's note: You can watch the MMS satellites launch on Space.com, courtesy of NASA TV. NASA's webcast will begin Thursday night at 8 p.m. EDT (0000 March 13 GMT).